The DRI-AC is a DIN rail mount, AC input signal conditioner with 1800 Vdc isolation between input, output and power. 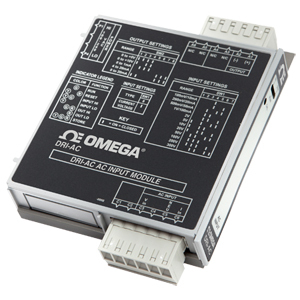 The field configurable input and output offers flexible, wide ranging capability for scaling, converting or buffering AC inputs ranging from 5 mA to 100 mA AC or 50 mV to 300 Vac. For current inputs above 100 mA, it is recommended that an input shunt resistor be used and the DRI-AC be configured for the proper input range. For example, a 5A current transformer output can use a 0.1 O, 5 W shunt resistor with the input of the DRI-AC set for 0 to 500 mV AC. The DC output of the DRI-AC is proportional to the average of the fully-rectified AC input signal, and is calibrated for sine waves between 40 to 400 Hz. The DRI-AC utilizes Touch Calibration technology which greatly simplifies calibration. The thermal drift and mechanical variability of the potentiometers has been removed and replaced with a digitally stable circuit. Once the unit is configured via DIP switches for voltage or current, the pushbutton is used to precisely calibrate the minimum and maximum levels. To set the input level within the dip switch configured range, simply apply the high input signal (voltage or current) and push the CAL button. The low input signal is then applied and pushing the CAL button again stores the low input signal. The high and low input levels are stored in nonvolatile memory and correspond to the high and low output levels. These output levels are precisely adjusted using the input signal. Touch Calibration technology enables precise calibration and provides more than 90% offset of the zero value and adjustment down to 10% of the full scale input span for most of the 16 switch selectable input ranges. For example, the dip-switch configured 0 to 200V input range could be calibrated via pushbutton for 0 to 80V (i.e. 60% span reduction) or offset to a range of 120 to 200V (i.e. 60% offset and 60% span reduction). If the output was configured for 0 to 10V, then 120 to 200V input would correspond to the 0 to 10V full scale output. Input ranges such as 180 to 200V or 0 to 20V are possible using the 0 to 200V range. Advanced digital technology combined with ASIC technology allows the DRI-AC to be field configured for virtually any AC input to DC output within the limits specified. The output of the DRI-AC can drive a digital meter for direct display or can interface with alarm or control devices including PLCs and computers. The DRI-AC has three diagnostic LEDs. The green (RUN) LED is used for diagnostics to indicate that power is on. It will flash quickly if the input signal is above the calibrated range or slowly if the input signal is below range. It is on continuously when the unit is functioning within the calibrated range. The yellow (INPUT) LED is on while calibrating the input level. The red (OUTPUT) LED is on while calibrating the output level. The DRI-AC can be configured for input ranges from 50 mV to 300V or 5 mA to 100 mA, with >90% input offset or it will adjust down to <10% of full scale input span (except on the 100 mV/10 mA range in which maximum offset or gain adjustment is 50%).